There's a fair amount of talking in Matthew Akers' portrait of the artist as enigma, the artist being the grande dame of performance art Marina Abramovic, a formidable woman who puts the diva in individuality. Curators, gallerists, exhibit attendees, even an ex-lover/collaborator: all have their say on the woman. And she speaks, as well, while giving little away. But it's actually the silences in Akers' documentary that are most revealing. Once the build-up to her 2010 retrospective, which gives the film its title, is past and what little back story is revealed (not nearly enough), Abramovic takes centre stage at New York's Museum of Modern Art for The Artist Is Present, her new piece. And says nothing. She sits in the gallery for almost three months, ensconced on what she describes as a film set, but what appears more like a shrine, receiving visitors who approach her as if in the presence of some mute soothsayer. But, as becomes clear (if the voiceovers are to be believed), they bring her quite a lot: the fuel for her performance fire. Because Abramovic (surprise, surprise) lives for her art and needs the audience's love. Or so says MoMA curator Klaus Biesenbach. It's a bit of a cliché, which is disappointing in a doc that seeks to unwrap a groundbreaking, convention-defying figure. The daughter of Yugoslav Partisans who has done quite well out of capitalism. A woman revered as a feminist pioneer, who did all the cooking and cleaning in her self-described traditional male-female relationship. A woman whose manifest (sic) decries the cult of personality, but who seems to spend her non-performance time doing endless photo shoots and whose exhibit attracts attendees who sleep overnight outside the gallery and rush the doors as if at a rock concert. Yes, that Abramovic: a complicated woman, to be sure. The drama in the narrative arrives in the shape of Ulay, an ex-lover whom she invites to participate in her retrospective. Their affair was played out as a series of artistic collaborations during a five-year tour of Europe living in a van (also on show in the exhibit), and nobody is quite sure how Ulay and Marina will get along 20-plus years after the break-up (also played out as art). As it happens, his comments are among the most revealing of a multi-layered character who is, in Biesenbach's words, "always performing". As Ulay tells it, after their break-up Abramovic went for the money. As she tells it, she was 40, fat and alone. Then she discovered couture. This seems to be the moment she stopped aging. Perhaps she has a portrait in Givenchy's attic. Abramovic's CV is dispensed with in hurried fashion, which is a shame, as it lays the groundwork for this latest feat of endurance. With so little attention paid to her intensely physical early work, which put her naked body at the centre, there is less context for the one which relies so heavily on stillness and allows her to remain clothed. After all the talking and theorising is done, one is left with the question: what does she actually do? Why all the fuss? 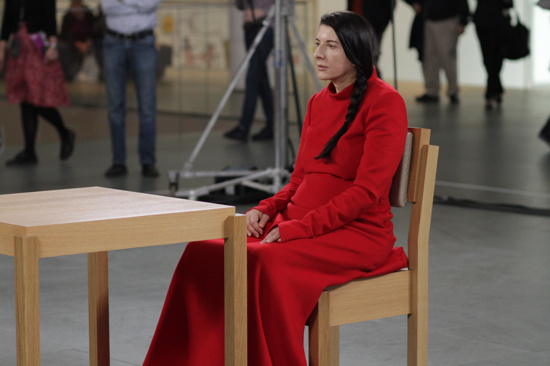 Once the doors open on Abramovic's retrospective and her "re-performers" are all settled upstairs, the queen settles on her throne, sheathed in her long red dress, closes her eyes and waits for the first subject to approach. Then she slowly opens her heavy-lidded eyes on the visitor, gets a reading and... something happens. Art, perhaps. Or perhaps it's that intangible thing between human beings in any setting, a transfer of energy, a mixing of sub-atomic particles. But, it's intangible and difficult to catch on camera. Here Akers focuses on the eyes, catching Abramovic's gaze and that of her silent interlocutor. Often the visitor is overcome with emotion. Some cry, some blink, even Biesenbach swallows hard when he is in the chair. But something happens. And that can't be swept away in accusations of hype which may well be valid. The doc becomes less about a diva artist in her dotage and more about exchanges between human beings who allow themselves to be vulnerable, and the impact those have on both parties. Abramovic is a commanding woman with considerable powers. Akers' triumph is to allow her contradictions to unfold, while not really demystifying her. The baffling David Blaine cameo early on is more relevant than anyone lets on: reality and illusion cannot always be easily separated. Marina Abramovic: The Artist Is Present is released theatrically today; for a full list of screenings check the Dogwoof website.